So, today, I decided to watch Kingsglaive: Final Fantasy XV on my Xbox One X, connected to my LG OLED B7 television via HDMI 2.0 cable, and I was a little surprised by what I saw. As soon as the movie started up I noticed the HDR icon appear at the top right of my screen. Having had this television for nearly three months, I’ve come to know that the HDR icon and the Dolby Atmos icon only appear when they’re natively supported by the media being played. If I put in Detroit: Become Human using my PS4 Pro, both the HDR and Dolby Atmos icons will appear. If I put in the 4K release of Gundam Thunderbolt then the HDR icon will appear. And if I put in any other 4K movie that I own, one or both icons are likely to appear. However, this should not be the case with a standard 1080p blu-ray. And yet, there it was, an icon reserved for 4K media appeared for a standard blu-ray. Once the movie itself had started, I did notice that the colors were a combination of more vibrant and more detailed. I was noticing details that I hadn’t seen previously, though a part of that may have been the movie being upscaled to 4K by my television. Regardless, there was a noticeable difference and without the need for a pricy 4K blu-ray. So if you happen to have Kingsglaive on blu-ray, and you happen to own a device that supports 4K HDR media(As I’m sure that’s necessary for the HDR alone. ), I suggest giving it a try. I’ve attempted to reproduce this on other standard Blu-rays, thinking I maybe just missed it before, but my search yielded no such results. Kingsglaive remains the only standard blu-ray I’ve seen to support HDR. This discovery makes it seem unlikely that a 4K blu-ray of Kingsglaive will appear any time soon since HDR tends to be a bigger selling point than 4K, and if you can get that sweet HDR on a standard blu-ray, but at upscaled 4K instead of native, what reason would you really have to upgrade to a 4K release? Probably not a lot. UPDATE 7/21/18 - After doing some further testing there is one issue I picked up on and that was thanks to 4K Harry Potter film I watched later in the evening. Kingsglaive, while playing on a UHD blu-ray player, has some visual noise that no amount of TV setting adjustments can seem to fix. This same thing occurred with the Harry Potter & The Deathly Hallows Part 2 4K blu-ray except it was far more pronounced there. After doing some research, the cause of the visual fuzz is apparently the HDR data itself. And thus, the only way to completely remove the fuzziness of the image is to turn off HDR. While I haven’t tested it myself, this is what has been recommended to me. However, as I mentioned previously, the problem was far more pronounced on Harry Potter than it was on Kingsglaive. 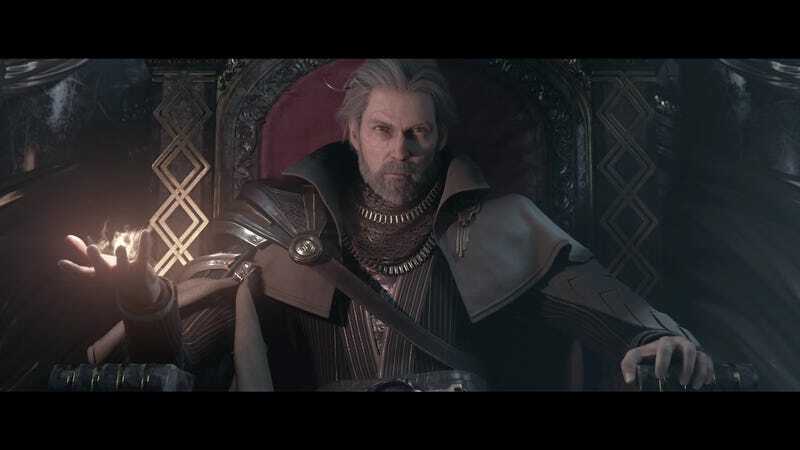 Kingsglaive was still far more clear and vibrant, and thus I still recommend viewing it on a 4KTV using a UHD blu-ray player, although I have read that a dedicated UHD player is better than the one in the Xbox One X, so that may or may not contribute to the problem as well.